March 6, 1997- Cheddi Jagan, the former Premier of British Guyana and President of Guyana, dies in Washington, D.C., after suffering a severe heart attack nearly a month earlier. 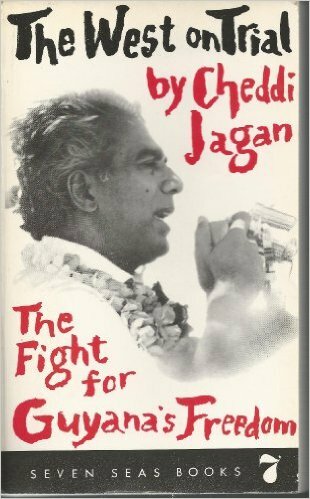 Jagan, born in Port Mourant, had risen to become a leading voice in the Guyanese movement for independence from Great Britain. This is his story about his life in Guyana and abroad and the long struggle faced by the Guyanese people in their quest for freedom. As a son of Indian immigrants who never owned a pair of shoes until the age of 12, his transformation into the future leader of Guyana reminds us that with focus, passion and dedication, life can be a most unexpected journey full of unimaginable surprises. This phenomenal account of Guyana, reveals the dark and complex cycle of exploitation resulting in the formation of racial tensions that divided the country and nearly caused its destruction. Further divided along sharp political lines, the battle to control the course of Guyana’s future unveiled the hidden motives of the British and U.S. governments. And these motives, helped promoted a civil war that is the most violent in the country’s history. The United States, caught in a grip of paranoia about the possible Communist influence in Central and South America, purposely meddled in the affairs of British Guiana. The actions and non-actions of the United States are an example of the misguided and nefarious foreign policy advocated as a result of the Cold War against the Soviet Union and the developing conflict in Southeast Asia. Guyana’s independence in 1966, was the first step in a long road the country faced in social, economic and political reformation. Guyana, is just in a long list of countries, that had been subject to foreign influence for far too many years. Jagan was ahead of his time and his vision and efforts for independence for Guyana remain a lesson to other nations also in the fight for their own political, economic and social freedom. Posted on February 19, 2016, in Biographies, Investigative Report and tagged Cheddi Jagan, Guyana. Bookmark the permalink. Leave a comment.